• For iPhone 7, iPhone 7 Plus: Hold down the Power Button and Volume Down button until you see the  Apple logo on screen. This action will restart the device. • For iPhone X, iPhone 8, iPhone 8 Plus (and iPhone XS Max and iPhone XS, though those come preinstalled with iOS 12): Click the Volume Up button then let go, click the Volume Down button then let it go, now press and hold down the Power button and continue to hold the Power button until the  Apple logo appears on the screen. This is how to force restart iPhone X, iPhone XS, iPhone XS Max. 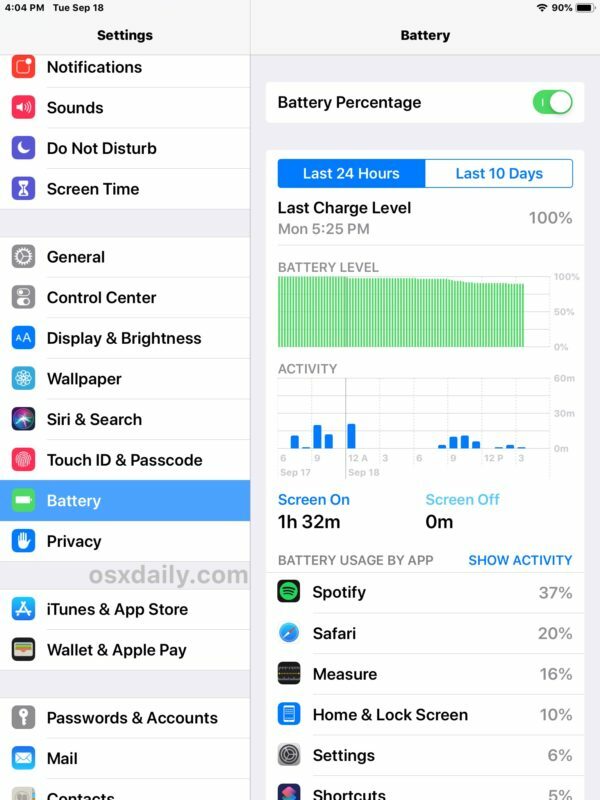 Some users have reported that disabling Screen Time on iPhone or iPad can lead to notably better battery life. The Screen Time feature is wonderful, but this may be worth a try for some users who are findin that battery performance is persistently lower since using iOS 12 and later. You can disable Screen Time in the Settings app, or specifically learn how to disable Screen Time in iOS here with detailed instructions. Another (time limited) option is to downgrade from iOS 12 back to iOS 11.4.1 as discussed here, but the opportunity to do so is limited, and there’s no guarantee that it will improve battery life. 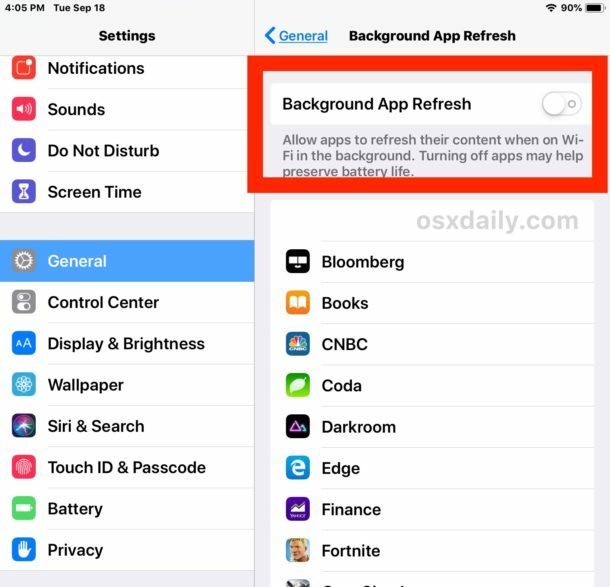 In fact, if you downgrade iOS 12 you will still need to go through the normal ‘waiting’ process that is recommended at the very beginning of this article. What do you think about battery life of iPhone and iPad with iOS 12? Have you noticed any difference? 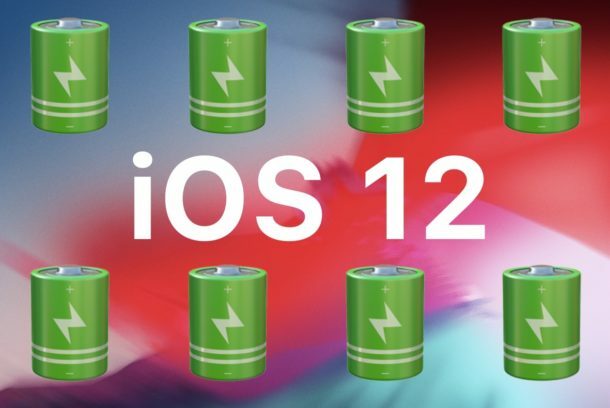 Did the tips above help improve your battery performance and resolve any battery life issues you were experiencing with iOS 12? Share your experiences in the comments below. When will these idiots at Apple get that we do not want everything turned on all the time, and figure a way so that when we do a major upgrade our settings stay the same? Staggers the mind just how little Apple designers are in tune with users, what we want and how we use our devices. Ideally they can make iOS modular and allow people to remove features that they do not want. Wait what? What does Background App Refresh have to do with bluetooth keyboards? I don’t get it. I think that he’s suggesting that folks who use the iPad with a physical keyboard would want multitasking more than other folks. That is, they want to use their iPad more heavily than others, more like a laptop or desktop computer, which do have multitasking. That’s not how you force restart an iPhone 8+. So far i like ios 12. What I don’t like is discontinuing the se, which shows ios 12 can be operated on a much less expensive platform. Besides, I don’t need emojis, i need longer battery life and fewer gadgets. I’m confused… is this Windows or MAC? Microsoft has constant patches to fix their dumb programmer mistakes; MAC is no better. How about Beta testing before releasing? Overpriced junk!! iOS 12 went through 12 beta versions. MacOS Mojave is currently in GM beta and a final version will be out in a few days. So they do beta test before releasing, I am not sure what your complaint is. The battery complaints surface every single release, it’s like clockwork with every new iPhone or iOS version. Most battery drain complaints are just because of upkeep on the iOS device fresh after installing an update. Sometimes it’s the normal upkeep maintenance takes a while, sometime’s it’s a settings issue, or rarely a hardware issue in which case replacing battery fixes it. It has nothing to do with beta testing, it is not a bug in this case, though sometimes a bug can be the problem too. You can toggle your settings a bit to save battery life, what is the drama with that? It would be worse if you could not change your settings to save battery life, would it not? The biggest drains on your battery are the surveillance apps that mask as ‘social media’ service. Do yourself a favor and get rid of those, your battery will last longer and your life will be happier. Social media makes people miserable. The only social network you need are your real friends and family, with text messages and phone calls and in person visits. Exactly who or what and why is involved with “Share my Location”? Seems to be a ‘bypass’ for for all the other switches? If the price of the 5SE comes low enough, I’m encouraged to retire my trusted battle-hardened 4-year old and switch. 5SE now available for €250 with 6 month guarantee if you look. Mine has digested iOS12 with no visible battery issues. The iPad Mini 2 does seem to go through a charge more quickly than before, but I will let the installation / upgrade housekeeping run it’s course for another week before grumbling anew. I gave up on the iOS 12 Beta twice and went back to 11.4.1, due to terrible battery life. Maybe I didn’t leave it long enough after updating for the iPhone to finish indexing, etc? In low power mode my 6s Plus would last 18 hours easily, and still have maybe 20% left over. Never got anywhere near that with iOS 12. Updated to iOS 12 GM last week and kept it on, removed the beta profile on Monday night, all seemed well. Now in the past two days the battery has been bad again – dropping incredibly quickly at times. What’s going on! Why suddenly start being terrible again after a few days? my iphone5s ios 12 updated. does not charge anymore. when i press the home & power button only apple logo appears and goes blank. i tried the overnight plug on the wall socket nothing change. This is all well and good for the first few days after installation, but WHY (you haven’t told me) am I experiencing rapid battery drain with no changes in usage habits, a week after install? You have not explained that. You just went into all the normal power conservation checklists. Why is iOS 12 a power hog? sometimes battery life is reduced right after a system software update because when you update the system software, iOS will undergo various routine maintenance tasks and background activities to be up and running again. This includes background activity like indexing your Photos, indexing Spotlight, facial recognition, iCloud activity, and many other background system tasks that can occur after a software update has completed. Operating systems are complex, but fortunately iOS takes care just about all of that in the background. The solution to this is as simple as it gets: wait. If you turn off the other stuff, then disable Screen Time too, your battery might improve with that off as well. Screen Time is a new feature that some people say might impact battery, try it. i updated ios 12.1 after updating i lost 3 % battery beta health . first was 90% but ny after update 87% if some buddy knows why answer thnks. iOS 12.1 appears to have fixed my battery drain issue. After I upgraded to iOS 12, I had to charge my iPhone 8+ by mid-afternoon or it would not last till night. After updating to iOS 12.1, I still had over 60% charge left when I got home, without needing the mid-day charge.